The Irish Water Spaniel is a spunky and life-loving creature. They are one of the easiest breeds of canines known to train as puppies. While they are very useful as watchdogs, they do lack in patience for strangers that may enter their homes. Extremely playful and full of energy they will crave being outdoors, especially in the water, hence the name Irish Water Spaniel is quite fitting for them. Great runners and rather silly canines, they are full of personality and love being with their families. They are a breed that can easily withstand very cold temperatures although they will prefer to live in an environment that allows them to live indoors and still have the freedom to play, roam and explore outside equally. While they are sweet and humorous canines, they are simple to train but will require an owner with a bit of patience in teaching the class clown. This athleticism of the Irish Water Spaniel is one of a kind. They get bored rather quickly, so placing these canines in a home with energetic and active people is ideal. If they begin to lack that stimulation they may have a tendency to act up. They enjoy having an agenda and will greatly appreciate having some type of companionship or mental stimulation during the day. A simple game of catch or a long walk on a leash will be suffice, some owners find it useful to exercise their dogs with any form of obedience training and they adore having a sense of feeling involved. Grooming your Irish Water Spaniel does require some effort. They bode very thick and wavy making it require some brushing a few times per week. You will need to scissor cut your Spaniel as they have a tendency to shed their fur coats but not completely. Some of those hairs end up getting stuck in the rest of their fur versus falling off during a normal shedding process. 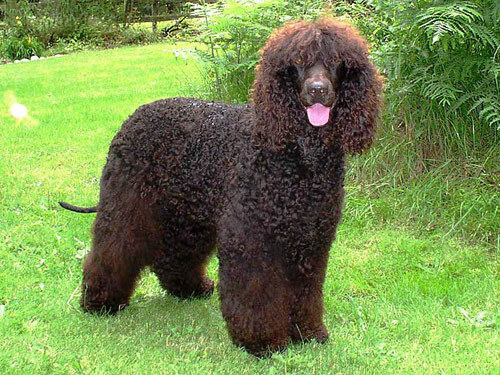 The Irish Water Spaniel bodes few, but notable health concerns such as otitis externa and CHD. They also have been known to experience issues with distichiasis, megaesophagus, seizures in rare occasions and also certain conditions effecting their nail beds as well. The vet may recommend certain tests as the Spaniel progresses in age such for their hips and their eyesight also. It also has become more aware that some Irish Water Spaniels can experience difficulties reacting to drugs that contain sulfur or ivermectin. Originating in the 18th century, the Irish Water Spaniel gained many fans for their water retrieving capabilities. It was sometime in the 16th century that the King of France was given an Irish Water Spaniel and from there, their visibility grew to make them a highly desired breed. They had a brief career as show dogs for their unique appearance, but have never became well known within the past one hundred years as a household pet. They were however, a very exciting sporting breed and can still be found commonly in Ireland.